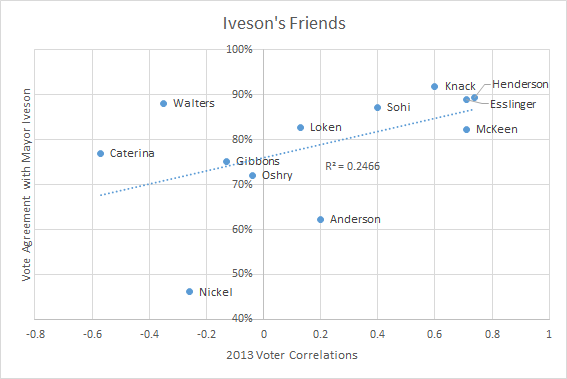 Back after the 2013 Edmonton municipal election, I did a quick analysis to see if I could predict who some of the new mayor Don Iveson's friends on council would be. My thought was that councillors with similar platforms to the mayor's, and who are potentially more likely to agree with him on votes, were also likely to get voter support in the same neighborhoods due to their similarity. It seemed plausible enough so I did a correlation analysis. It's now been a decent enough time since the last election that I've decided to check if my guess was accurate or not. Let's take a look! 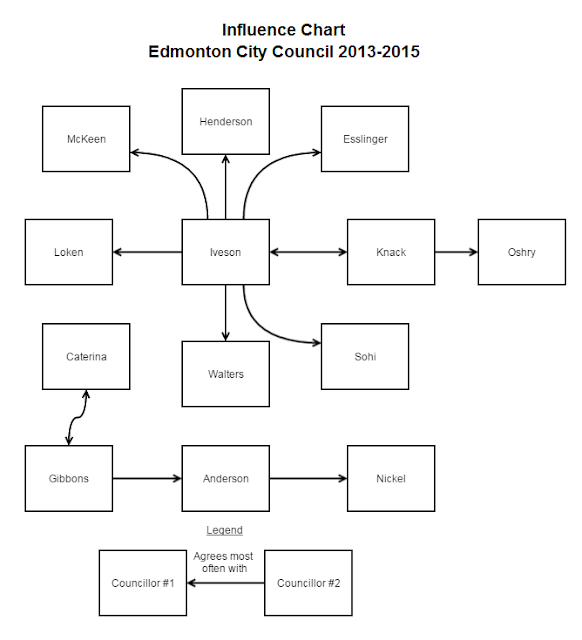 Edmonton's Open Data has a log of the voting record for the 2013-2017 council, and it is fairly long. All told, there were 2,757 different motions that had been voted on so far. One issue with taking a look at all of these combined is that plenty of the votes are for procedural matters in council that get passed quickly and unanimously, and they're kinda boring from an analysis point of view. Of the 2,757 motions that have been voted on, 2,611 were unanimous one way or another. So let's ignore those, and focus on the remaining 146 contentious votes. One of the first things to notice is that mayor Iveson does seem to have a fair bit of support on council - 7 councillors tend to vote the same way he does more than 80% of the time, and that's enough for a majority on most votes. These same 7 councillors (Knack, Esslinger, Henderson, Walters, Sohi, McKeen, and Loken) all tend to agree very consistently with each other too (with the possible exception of councillors McKeen and Loken). I wouldn't go so far as to say that they act as a voting block, but there certainly is evidence that they get along very well professionally, to say the least. Other interesting observations include that councillors Loken, Caterina, and Gibbons all vote together quite a bit, with councillors Caterina and Gibbons agreeing more with each other than with the mayor. Councillors Anderson and Nickel quite clearly do not see eye-to-eye with most of the rest of their council colleagues. Back when I did the original analysis, plenty of people (including myself) were surprised at the fact that councillor Walters ranked so low on the list. It turns out they were surprised with good reason, as he is one of the most notable outliers on the graph. It looks as though the analysis was alright, but nothing to be proud of. It is perhaps better than a random guess, but not necessarily something that provides critical or accurate insight immediately following an election. 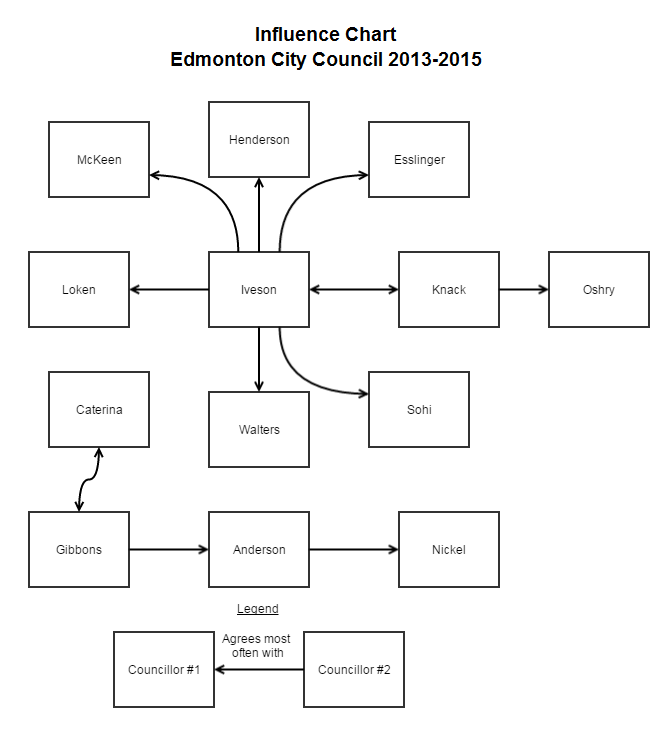 This shows that for seven councillors, the person they agree with the most is mayor Iveson. The remaining councillors tend to split off in a group where they agree with the Caterina/Gibbons group that I mentioned above, though the frequency with which they agree with either of those two councillors is significantly lower than how often the rest tend to agree with the mayor. The results from this analysis could exist due to a large number of different reasons. It's possible, for example, that this is an example of mayor Iveson's abilities to gain support from his councillors, and it's equally possible that it shows his ability to listen and accommodate the views of his councillors. Either way, it is his job to be the leader of city council, and so far the data seems to suggest he's doing just that. While it's good to have one unified council, and Don Iveson has done a great job at his leadership, I'm glad there are also a few checks and balances to scrutinize motions to ensure the best outcome results.